Shoot ‘em ups are timeless. 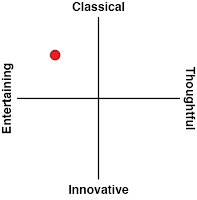 This genres is almost as old as the video game medium itself, but it remains popular to this day – from Spacewar! to Asteroids to R-Type to Resogun, there’s endless excitement to be found in the simple premise of a nimble spaceship weaving through enemy fire and gunning down attackers by the dozens. 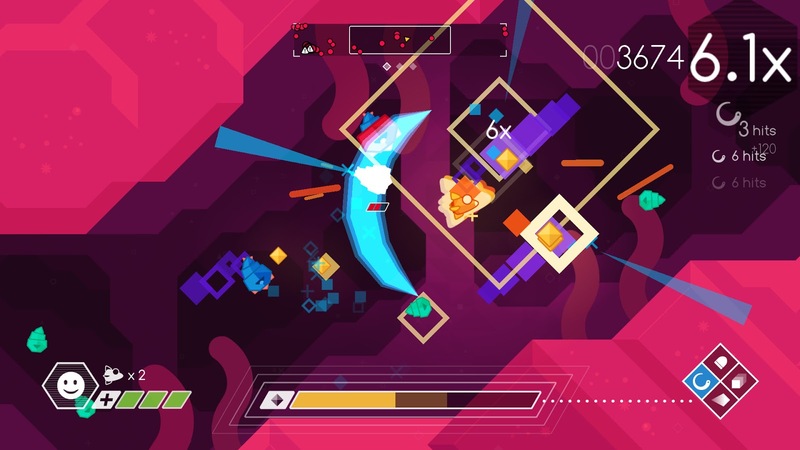 Graceful Explosion Machine is no exception to that rule, but it’s striking presentation and subtle tweaks to the classic formula are enough to make it stand out from the crowd. The first thing you’ll notice when you fire up the game is its bright colours and use of simple geometric shapes. 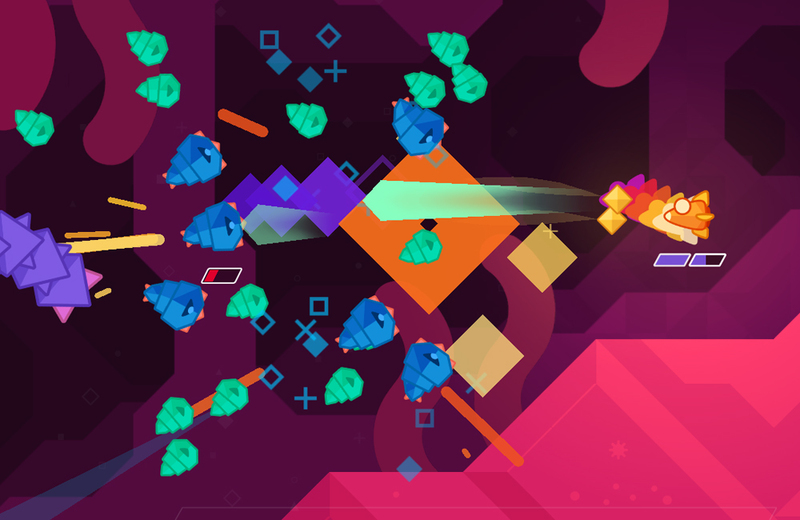 Shoot ‘em ups are often colourful, but rarely as vibrant as this one, with its neon jewel palette and sharp colour contrasts. Each planet has its own colour scheme and unique identity, from the bright pink of Magnetos Prime to the muted (by this game’s standards) mustard hues of Aurum Tau. There’s hardly a drop of black or white, which is rare in any game, but particularly so in a space-themed shooter. Related reading: Bullet Soul: Infinite Burst is another great shoot 'em up that came out recently. 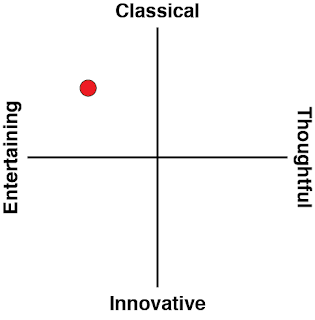 Read Clark's review. Enemies are similarly identifiable by their colours, so that you can see at a glance exactly what you’re dealing with. Somehow, despite the array of different colours for both alien ships and planets, there’s always a stark contrast to make your foes stand out from the background. This means that as frantic as the game can get – and it gets chaotic – you can always see everything you need to see in an instant, and never run the risk of mistaking scenery for an enemy or vice versa. 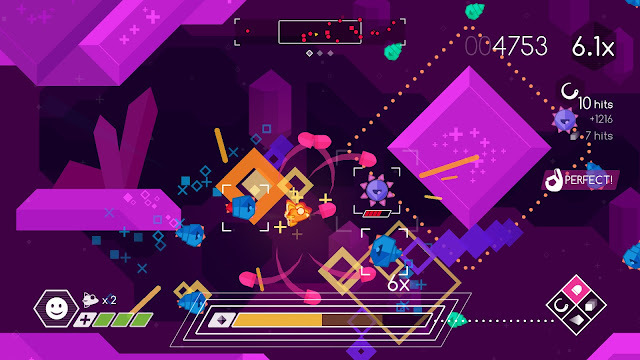 The art design in Graceful Explosion Machine isn’t just gorgeous, it’s practical. That’s something you’ll be grateful for when the game starts throwing its hordes at you. In a lot of ways, this is your typical shoot ‘em up: your main weapon is a rapid-fire blaster, and enemies range from little nuisances that rush you on large numbers to those that hang back and shoot or tank your shots with large health bars. An assortment of special weapons let you dish out damage that your blaster just isn’t capable of, but ammunition for these weapons is finite so you have to be mindful of the best times to use them. So far, so familiar. Instead of your standard ammo systems, though, those special weapons share a single power meter, and the cost varies from weapon to weapon. Refilling the power gauge involves collecting yellow crystals dropped by defeated foes, but if you deplete the bar entirely you’ll be without your special weapons for a few precious seconds before it starts to recharge. The blaster has its own heat gauge to manage, with shots becoming less frequent when it gets close to overheating and falling out of commission for a moment or two if it goes over the threshold. 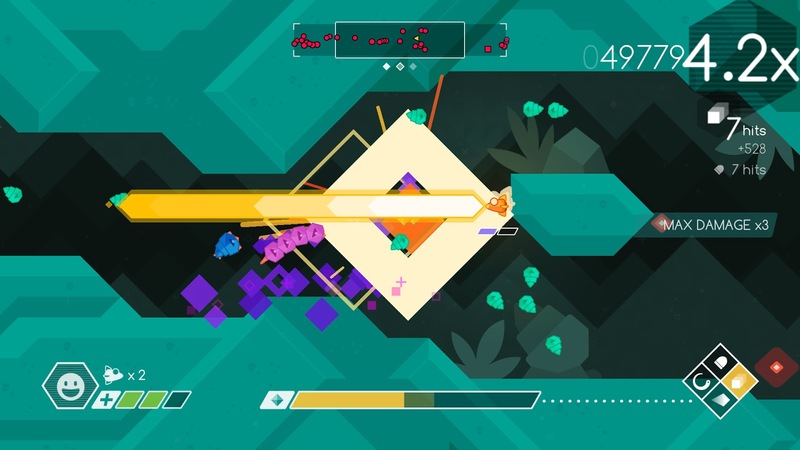 Juggling these different systems is where a lot of the fun lies in Graceful Explosion Machine. There’s a natural ebb and flow that emerges from the two resource gauges: clear a big group with special weapons until you’re almost out of power, then collect crystals and recharge while picking off stragglers with the blaster until it’s about to overheat, at which point you should have enough power to drop another special weapon assault. When you know the weapons, level design, and spawn patterns well, you can chain this back and forth between blaster and special weapons endlessly – which, by no coincidence, is the key to getting high scores. That takes some practice though, because there are a lot of things trying to interrupt your rhythm, from the different enemy designs to the level layouts themselves. Different enemies all have their strengths and weaknesses; turrets have shields that make them hard to take out with anything but the Sniper Beam weapon, but using that slows your movement, making you more susceptible to other attacks. On top of that, the laser can’t pierce other enemies, so you need a clear line of sight with the turret, which isn’t easy when there are swarms of little cannon fodder bugs flying around. Missiles make quick work of the bugs, but they cost a lot of energy and are less effective against armoured enemies or in situations where you’re surrounded. The Energy Sword helps a great in the latter case, with a full circle attack arc around you, and it can also destroy enemy bullets, but its range is limited. Juggling these four attacks (Blaster, Energy Sword, Sniper Beam, and Missiles) is the key to victory. The levels are cramped, and in most cases they loop around. Breathing room is hard to come by, but it’s a precious resource, whether you need a moment to recover energy, or just need to reposition a big group of foes so you can focus fire on a bigger threat. To aid with this, you can dash through enemies (but not enemy bullets!) and flip your ship around at the press of a button. Like everything else, the semi-invincible dash is a limited resource – you can only dash twice in succession, though it takes only a second or so to recover your dash count. Put all these things together, and you’ve a got a frantic, intense, and unexpectedly tactical shoot ‘em up. For me, the most effective strategy was herding enemies by dashing back and forth to gather a group and then leading them into a corner, before taking them out in one big sweep with a Missile barrage and refilling the power gauge almost immediately with the dropped crystals. This is a good way to get that precious breathing room, take out a lot of the more nuisance enemies, and allow you to focus on the more dangerous enemies without distraction. You might find something else that works for you, and that’s part of the fun of the game. This isn’t a heavily-patterned bullet hell shooter that’s all about learning the choreography; it’s a game about mastering the tools at your disposal and thinking on your feet. Some people might find it a bit on the easy side, especially if you’re coming from a bullet hell background, but I found the difficulty in Graceful Explosion Machine to be just right. It has a rather unforgiving life system with just three lives per level, though your ship can take three hits before you lose a life and get sent back to a checkpoint. The levels are short enough that this never becomes frustrating, though, and the whole game is so well put together that death never feels like anything other than your own failure. You only need to complete half or so of the levels on a planet to unlock the next one, so even if you do find the game difficult, it shouldn’t be too hard to at least see what each world has to offer. On the other hand, for those who want more of a challenge, there’s a complex scoring system to master, as well as more difficult bonus levels. Graceful Explosion Machine is simple, pure arcade fun, with a level of polish and attention to detail in the design that’s rarely seen. It’s the sort of game that you can pick up for a quick 5 minute session, and then find yourself still playing hours later.